FRELDO AND OTCEED GLOBAL EXCHANGE PARTNERSHIP ANNOUNCEMENT! We are glad to announce a strategic partnership with company OTCEED Global Exchange(https://otceed.com). OTCEED is an institutional trading firm based in Oslo, Norway and focused on providing two-way OTC transaction settlement for both private and institutional clients. 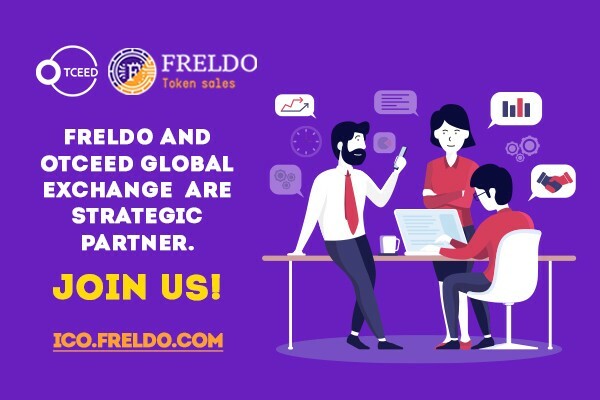 OTCEED Global Exchange and FRELDO collaboration will be useful and mutually beneficial and will allow constant platform and product improvements. Partnership with OTCEED Global Exchange invested to Freldo ICO 6 000 000 USD. It is an important event for both of the companies as they both will benefit from this mutual trade. It strengthens both of the parties with a volume sale of their tokens and assures them of their further operations. OTCEED Global Exchange is covering most of the popular fiat and cryptocurrencies such as USD, EUR as well as BTC, ETH and all ERC20 tokens. OTCEED Global Exchange offers all kinds of cryptocurrencies and fiat trading, exchange, settlement and swaps to cover all your needs in one place.